My Review: I really enjoyed reading The Faerie Guardian. The story progresses at a consistent pace and the characters seem well developed. It is written in first-person present tense, which I believe helps with that a lot, as I felt more in the moment. However, there is far more telling than showing in this series—a trait I’m beginning to realize is fairly popular and acceptable in young adult/teen novels. The tone was light and humorous. It was believable for a seventeen year old girl, though maybe a little odd for a seventeen year old faerie from a secret, magical town. I loved the world the author has created, and I liked the feel good, familial-type atmosphere Violet is surrounded by in Creepy Hollow—that is, if you ignore the extreme hostility she receives from Ryn and most of her peers. There is also a ton of action and fight scenes where I wasn’t sure she would come out on top. I think the author’s strongest talent yet is describing action in great detail. I actually think Ryn might be my favorite character—no, he definitely is. And that’s because the author ends up revealing so much depth to his character that you can’t help but relate to him. I knew he would end up being a big part of the story, I just hadn’t quite realized how until I got there. I feel like the issues with Nate were slightly obvious but I think it was intended for the readers to understand while the main character did not. I would explain but I detest spoiler reviews. 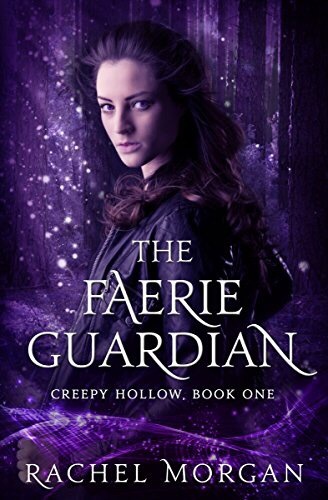 The Faerie Guardian is interesting, and I will definitely read more books in the Creepy Hollow series. But, it’s far from over. If I’m being completely honest, I’m slightly annoyed that the big struggle at the end was a little off topic. It is related to the main issue, but I kept thinking it was building to the issues between Nate and Violet. It was, but those issues were never, ever faced. The story ended shortly after, and I’m expected to read the second book in the series to see that issue resolved—unless it spans over the entire series. Overall, the story held my interest and I’ll be reading/reviewing the next book in the series soon. You can pick up your copy of The Faerie Guardian (Creepy Hollow #1) on Amazon for free right now (resuming to 99 cents soon) or through Kindle Unlimited.